this is what reading times usually ends up looking like. basically a wild animal show. but surprisingly before this happens i can get at least one full chapter in. right now we are reading the narnia series. i've read some of the books before but it feels a bit different reading them to my kids. this was especially true while reading the lion, the witch and the wardrobe. it was somehow more emotional. i don't know why exactly. maybe it was my hope that they were "getting it". maybe it was the way it reminded me. reminded me of what Christ did for me. "then others-evil dwarfs and apes-rushed in to help them, and between them they rolled the huge lion over on his back and tied all his four paws together, shouting and cheering as if they had done something brave, though, had the lion chosen, one of those paws could have been the death of them all. but he made no noise, even when the enemies, straining and tugging, pulled the cords so tight that they cut into his flesh." it probably goes without saying that i could hardly read this chapter through my tears. a sight my kids always find interesting. at first they may have thought it odd. but it opened up a discussion. we talked about Christ's gift to us. i was able to explain, again, how he suffered beyond anything them or i could imagine to save us. how even though he had complete power over those who persecuted him, he paid our debt for us. and even better than this? "the rising of the sun had made everything look so different-all colors and shadows were changed-that for a moment they didn't see the important thing. then they did. the stone table was broken into two pieces by a great crack than ran down it from end to end;and there was no aslan." "but what does it all mean? asked susan when they were somewhat calmer. it means, said aslan, that though the witch knew the deep magic, there is a magic deeper still which she did not know. her knowledge goes back only to the dawn of time. but if she could have looked a little further back, into the stillness and the darkness before time dawned, she would have read there a different incantation. she would have known that when a willing victim who had committed no treachery was killed in a traitor's stead, the table would crack and death itself would start working backward." my kids and i talked about his triumph over death and what it means for us. the gift of salvation. the gift of eternity. i'm thankful for the work of c.s. lewis because he gave us one more way to share the gospel. what i'm even more thankful for is that i know it isn't a fairy tale. i'm sure many people read this book and think, "what a great story". but it isn't just a story. it is a gift, that can change your life if you understand it. And I love that you are reading it to your kids. Stopping by for Thankful Thursday! I read the series to my 5th graders when I taught in public school. It was amazing to share the gospel with them that way...the Christian kids would explain the "real" meaning of the book to the other kids in class. Made my heart SO full. This is one series I can NOT wait to read with Claire!! 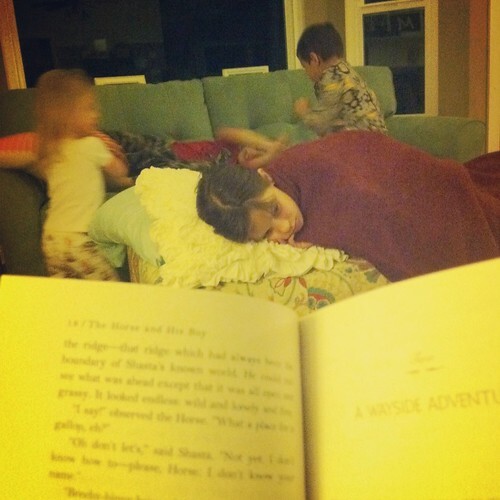 My kids loved that read aloud too. So exciting to watch them make those connections (when it's not chaotic of course)! I can't wait to read these with my future kids..I'd be super emotional even trying to explain the significance! we just finished reading "Voyage of the Dawn Treader." i've done a lot of crying as we've read the Narnia series. My 3 look at me thinking, "there she goes again." The books have prompted some moving conversations between us, and have revealed so much of God's generous love. You are right, it is a life changing gift. i've never read that series but heard it's good. I recently read The Lion, The Witch, and The Wardrobe to my kids as well. They all loved it and when we were done, we watched the movie together. I love that series! And yes, I read parts of it through tears as well. It makes for some great conversation. I'm with you, sister!